Berkeley 36-Inch Vanity Cabinet in Dark Chestnut If your bathroom's asking you for a facelift, the Berkeley is a worthy choice. At once elegant, classic and contemporary, the Berkeley vanity lends an air of sophistication and charm to any bathroom, from a Soho penthouse to a rustic country home. Carefully hand built to last for decades and finished in Dark Chestnut or White, this solid wood vanity has counter options to compete the timeless look. Available in multiple sizes and finishes. 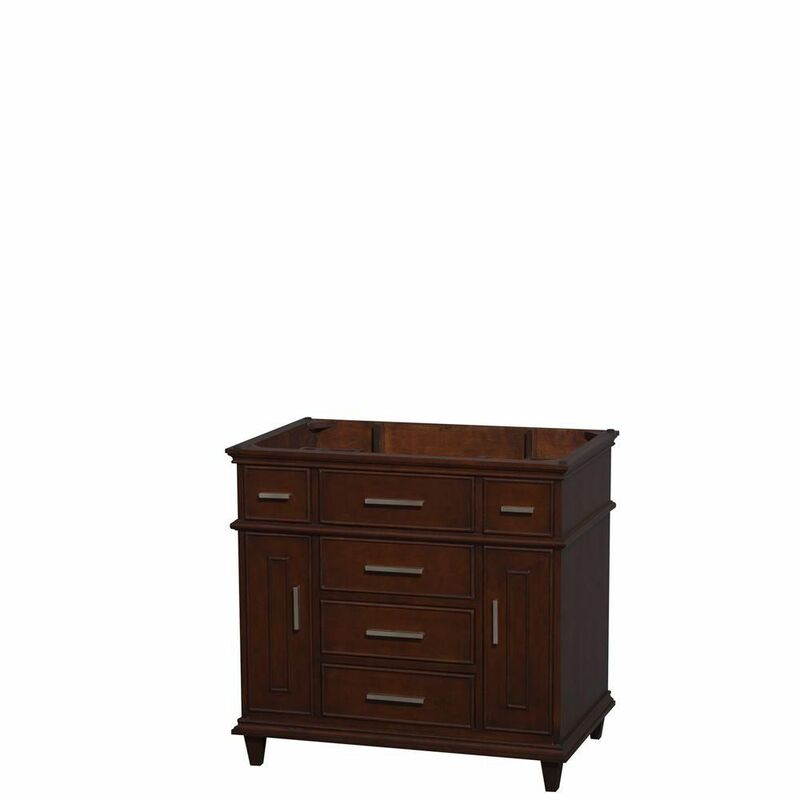 Berkeley 36-Inch Vanity Cabinet in Dark Chestnut is rated 4.8 out of 5 by 4. Rated 4 out of 5 by Maria from Beautiful piece, except the pictures made it appear more brown... Beautiful piece, except the pictures made it appear more brown than burgundy toned. It’s more “reddish” than I expected. Rated 5 out of 5 by Ali from Really nice cabinet!!!... Really nice cabinet!!! Rated 5 out of 5 by Tony from we unpacked the vanity and it seems A-OK, lives up to our expectations will fill you in when it's... we unpacked the vanity and it seems A-OK, lives up to our expectations will fill you in when it's installed as to functionally. In the meantime great product, delivered timely and packed well. Many thanks. Rated 5 out of 5 by Bumblebea from Great Look This cabinet is very well made. The dark wood color matched perfectly with the linen tower I also bought. It arrived in a few days and with no damage. I loved it was already put together. Love, love, love all the drawers. Looks great it our new bathroom.